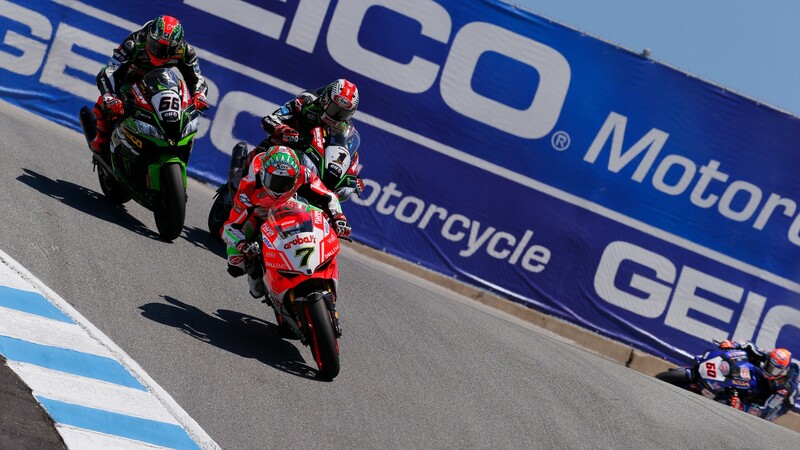 Overtaking the halfway point of the season, the MOTUL FIM Superbike World Championship has seen six different winners from seven different rounds so far in 2018, and the show doesn’t stop there as the circus roars into WeatherTech Raceway Laguna Seca. Set in the stunning Californian hills, a stones throw away from the coastal town of Monterey, Laguna Seca is a favourite of many, but not one for the faint hearted. As riders hurtle down into the high speed turn one it’s all to play for, and there’s no telling who will come out on top. We want you to be ready for the American battle. Undeniably the favourite heading into the GEICO US Round is championship leader Jonathan Rea (Kawasaki Racing Team WorldSBK), who finds himself in the rare situation of looking to bounce back from a difficult race two last time out. With his first zero points score for the first time of the season, the Northern Irish rider heads to Laguna hoping to extend his championship lead as the summer break looms. Only finishing off the podium on two occasions out of eight in California, Rea will look at taking his victory tally to four here, as his overall number of victories continues to grow past the record breaking 60. Despite a determined Rea, Chaz Davies (Aruba.it Racing – Ducati) will be a man on a mission around a circuit he is notoriously strong at. Coming off the back of some difficult races with his Panigale R, where he and his team have struggled to find a solution to their set-up issues, Davies was able to show his grit and determination to take a podium finish in race two at Brno. Laguna Seca has been a strong circuit for the Welsh rider in the past – he has the most victories over anyone else on the grid (three) and the most experience from his time in the domestic American championships. Ready for a fight, he’s not one to count out. For the American fans, all eyes will be on their home heroes as Jake Gagne (Red Bull Honda World Superbike Team) and PJ Jacobsen (TripleM Honda World Superbike Team) prepare for their homecoming around the stunning 3.6km ribbon of tarmac. For Gagne, he returns to the scene of his debut WorldSBK race, whilst Jacobsen prepares for his SBK® debut around Laguna Seca. Gagne has had a testing season so far getting acquainted with the CBR1000RR Fireblade SP2 machine, but finishing over half his races in the points will no doubt give him motivation ahead of a big weekend. For Jacobsen, he returns to racing around Laguna for the first time in seven seasons, so he won’t have that ‘home track’ advantage. Despite this, the atmosphere and support of the American crowds will no doubt give him a boost to continue to improve his Honda machine. One team heading to California full of confidence will be the Pata Yamaha Official WorldSBK Team, as the duo of Michael van der Mark and Alex Lowes have taken three out of the last four victories in WorldSBK. Getting the monkey off their backs this season, the pair will be taking on the weekend with a fresh outlook. For van der Mark, Laguna has been a tough challenge in the past with a best finish of fourth in 2016, but with the new found confidence on the YZF-R1, his pace will be interesting to follow. On the other side of the garage, Lowes has had two top sixes out of eight appearances around the circuit, and given his improving pace he will no doubt hope to build on this. With the smiles still etched on their faces from their debut victories, will they leave Laguna feeling the same? Steadily making progress and perhaps an underdog this weekend will be Eugene Laverty (Milwaukee Aprilia) as he continues to get to grips with his RSV4 RF, securing a top four in tricky track conditions last time out. The Irishman has struggled with rear grip all season, but making some steps forward could mean a strong weekend here in California. Winning race two in 2013 for the Italian factory, Laverty has a strong history here and we could see our eighth different podium finisher of 2018. Loris Baz (GULF ALTHEA BMW Racing Team) is preparing for his return to the Californian circuit, after four seasons away. Tackling the fast and technical circuit with a new bike for 2018 – compared to the Kawasaki he previously raced on – Baz will be looking to continue a strong run of form he is finding with his BMW S 10000 RR. Taking a ninth and sixth last time out around Laguna, his previous knowledge could prove invaluable. Spaniard Jordi Torres (MV Agusta Reparto Corse) prepares for his fourth weekend around WeatherTech Raceway Laguna Seca, but this time with a new team. Making steady progress with the Italian bike, the eighth round of the season will be a testing one for Torres. But with a solid history in California – taking a top eight in every race he’s finished – he will no doubt be a strong contender for a good result. Enjoy all the action from California, all with the WorldSBK VideoPass as bikes rev into Monterey from 22nd – 24th of June. Free Practice begins on Friday at 09:45LT (-7 GMT), with lights out for Race One on Saturday at 14.00LT, and Race Two on Sunday at 14.00LT.